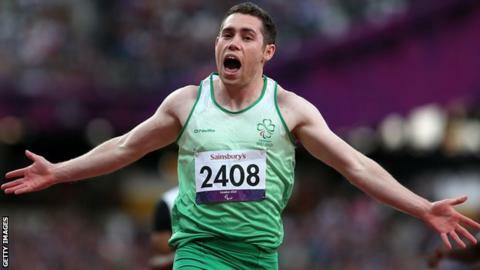 Irish Paralympic star Jason Smyth is convinced Olympic qualification remains within reach four years after he narrowly missed out on joining Usain Bolt in the 100m entry in London. Smyth retained his T13 sprint titles at the London 2012 Paralympics after being 0.04 seconds from clinching a 100m spot at the Olympics a few weeks earlier. Visually-impaired Smyth will chase the Rio Olympics 100m mark in a series of meetings in Florida over the next five weeks. "I still absolutely think the Olympics are possible," says the 28-year-old Northern Irishman. "I ran 10.22 in 2011 plus 10.24 in 2012 and a windy 10.17. I know in 2012 that I should have run the standard. "I just kept making silly mistakes because I was trying to force it to happen instead of letting it happen," adds the county Londonderry man, who became a father for the first time last October a week after winning his fifth World Paralympic title. The IAAF has reduced the 100m Olympic standard to an even quicker 10.16 seconds for Rio - 0.06 inside Smyth's personal best - but the Irishman remains undaunted as he prepares for his season opener in Gainesville on Friday. Oscar Pistorius is the only track and field athlete to have competed at an Olympics and Paralympics in the same year after achieving the feat in London. Smyth, the world's fastest ever Paralympian, says he has travelled to the US in his "best shape since 2012" after enduring an injury-affected three years. The Northern Irishman damaged a knee during a weights session in January 2013 and after unsuccessfully attempting to manage the ailment for a frustrating two-year period, eventually underwent surgery 15 months ago. "I was pulling the bar up from the ground and I didn't get my knee away and I smashed it," recalls Smyth, who as an eight-year-old was diagnosed with the genetic condition Stargardt's Disease, which has left him with less than 10% of normal vision. "I couldn't event squat without getting pain. It just got to the stage where nothing was working after a couple of years trying to manage it, so it had to be surgery." After the knee operation in January 2015, the four-time Paralympic gold medallist was only able to resume light jogging three months later and while he never considered retirement, he admits he had concerns that his best sprinting days might be behind him. "You do go through periods of wondering whether you are going to get back to where you were. I was struggling," recalls Smyth. However, the unusually late October date of last year's IPC World Championships in Doha gave the Derryman a chance to salvage something from 2015. Progress after the operation was initially slow but by end of August he was racing again and an invitation to compete in a special 100m race in Rio involving Paralympic stars from several disability categories was a further morale boost. With concerns over the Zika virus not yet having surfaced, Smyth was content with both his performance and the conditions in the Olympic city as he won the event ahead of American star Richard Browne. "I know if I'm beating these guys when I'm not anything like 100%, then I'm always going to be alright. "Being there exactly a year before the games and seeing the weather, I was pleasantly surprised because temperature wise it was perfect and the people were very friendly as well," adds Smyth, who will only defend one title in Rio after the International Paralympic Committee opted to remove the T13 200m from the programme. "And as regards the World Championships in Doha, they couldn't have worked out better with the later date. "It was all about going there and winning because that is money in the bank for me." Smyth opted out of the defence of the T13 200m in Qatar as he rushed home to be with wife Elise, who was due to give birth to their first child. Little Evie arrived six days later but with, by Smyth's admission, Elise taking on the bulk of the baby duties, the sprinter is still getting his "beauty sleep". Under the eye of coach Clarence Callender at Lee Valley in London in addition to regular monitoring at the Sports Institute of Northern Ireland, Smyth has had six months of uninterrupted training since Doha in an effort to make up for lost time. Smyth says his "numbers in the gym" over the winter and spring were very encouraging as he built up towards a Florida trip likely to prove pivotal to his Olympic ambitions. He has run under 10.30 seconds for 100m nine times and eight of those performances came on the Clermont track west of Orlando from 2011-13 when he was training alongside a group of world-class sprinters which included Tyson Gay. After racing in Gainesville on Friday, Smyth will compete in the first of a couple of Clermont meetings on 30 April. "For me, it's about giving myself the best opportunity," adds the Northern Irishman, who became the first Paralympic athlete to participate at a European Championships in 2010 and then raced against Bolt and company at the World Championships in Daegu a year later. "The good weather and the good conditions give you the best chances of running the Olympic time. "If I need to extend my trip, if I'm knocking on the door, I will do that just to give myself every possible opportunity."